Based on the network type, OSPF router can elect one router to be a Designated Ruter (DR) and one router to be a Backup Designated Router (BDR). For example, on multiaccess broadcast networks (such as LANs) routers defaults to elect a DR and BDR. DR and BDR serve as the central point for exchanging OSPF routing information. Each non-DR or non-BDR router will exchange routing information only with the DR and BDR, instead of exchanging updates with every router on the network segment. DR will then distribute topology information to every other router inside the same area, which greatly reduces OSPF traffic. To send routing information to a DR or BDR the multicast address of 224.0.0.6 is used. DR sends routing updates to the multicast address of 224.0.0.5. If DR fails, BDR takes over its role of redistributing routing information. Every router on a network segment will establish a full neighbor relationship with the DR and BDR. Non-DR and non-BDR routers will establish a two way neighbor relationship between themselves. On point-to-point links, a DR and BDR are not elected since only two routers are directly connected. 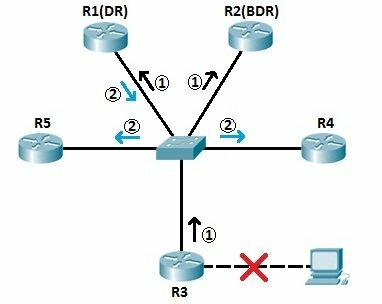 router with the highest OSPF priority will become a DR. By default, all routers have a priority of 1.
if there is a tie, a router with the highest router ID wins the election. The router with the second highest OSPF priority or router ID will become a BDR. All routers depicted above are in the same area (area 0). All routers are running OSPF. Routers R1 and R2 have been elected as DR and BDR because they have the highest and the second highest router ID. If, for example, R3’s directly connected subnet fails, R3 informs R1 and R2 (the DR and BDR for the segment) of the network change (step 1). R1 then informs all other non-DR and non-BDR routers of the change in topology (step 2). Router R3 will be in the 2WAY state with every other non-DR or non-BDR router. You can influence the DR and BDR election process by manually configuring the OSPF priority. This is done by using the ip ospf priority VALUE command interface command.